The family room is a central feature in this basement / guest quarters project by Neil Kelly Designer Matt Sipes. From the practical to the extraordinary, your basement has untapped potential. How you use it says a lot about who you are, what your family needs and how you enjoy spending “downtime” together. Cosmetic Upgrades — Cosmetic upgrades that lighten up the space with modern materials can take as little as 6–10 weeks to finish and make all the difference. When planning a cosmetic upgrade, take into consideration where your utilities are — where is the furnace and water heater — what is a comfortable head height and are there enough windows that meet egress requirements? 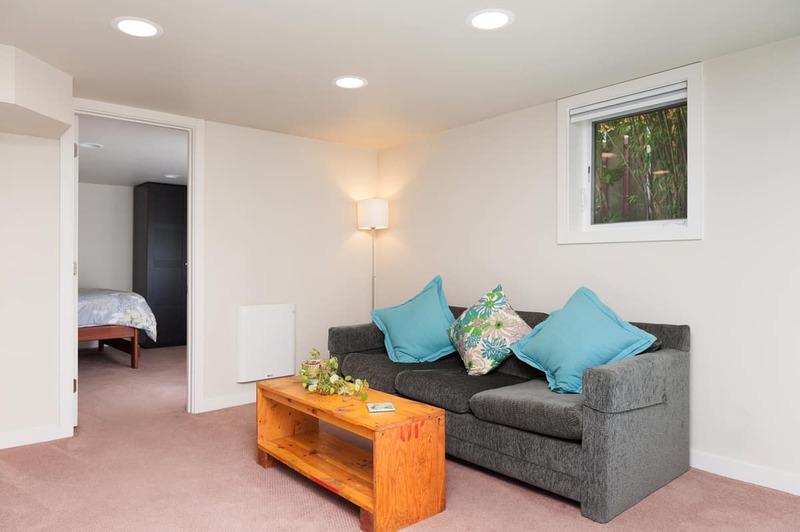 Additional Living Space — Whether you need more family room or you’re building an accessory dwelling unit (ADU), basements can double your living space or create room for long or short term guests. 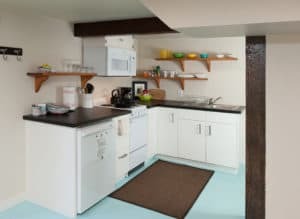 Items to consider include separate entrances, number of bedrooms, a kitchen versus a kitchenette and the associated plumbing requirements, a bathroom and the location of the main sewer line. Foundation Replacement — When a foundation is old, crumbling and leaking water, it’s time for a new one. Lifting an entire house to build a new foundation allows you to reexamine the size of your basement, whether you’re creating a simple crawl space or doing an entire excavation. These projects typically require a minimum of two months depending on the size of the house, and other considerations like the age of the sewer and water lines. The Busy Parents (Master Suite) — You need space. A quiet den to actually sleep or if given a spare moment to yourself, a place to curl up with a book. A basement master suite offers just enough space away from the rest of the family for it to feel like a private retreat. The Enthusiast Entertainer (Wine Cellar/Party Room) — Whether it’s the art of collecting bottles from your favorite vineyards, or hosting the ultimate weekend cocktail hour, you’re a connoisseur of all the things that make life great — libations and those you share them with. You need a space to host them all. The Multitasker (Home Gym) — Fitness happens in the spur of a moment, from dusk till dawn. You need a space to run, lift, downward dog and stretch out all before the 9am conference call. The Tinkerer (Studio) — Maybe it’s the space where you restore vintage bicycles. Or the Esty shop sewing room for baby bonnets. Or the model trains you assemble and paint like your father did before. Whatever your hobby — the constant project in the back of your mind — you need space to explore, tinker and create. The Easy Goers (Family Room) — You understand that a messy house is where memories are made. That comfy couches, shelves filled with toys, coloring books and games, and an entertainment center that’s dedicated to Disney brings joy to anyone who enters the space. The Thrillist (Media Room) — It doesn’t matter whether you’re a cinephile, gamer or audiophile, what matters is that you have a space to get lost in. A space to get absorbed into another time, world or place that media takes you. The Busy Bee (Home Office) — Your clock runs beyond 9 to 5. It might be because your best ideas come after hours, or that your entrepreneurial and freelance spirit runs deep, or that there simply aren’t enough hours in the day to complete it all in the office. This is your space to make stuff happen. To get things done. Want to give your basement a makeover but don’t know where to start? Schedule a consultation with Neil Kelly’s Design/Build Remodel Team.